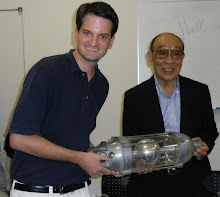 Director Yoshimitsu Banno at a Q&A event in 2014. Photo by Brett Homenick. Advanced Audiovisual Production, Inc., has announced that writer-director Yoshimitsu Banno passed away on May 7 at the age of 86. 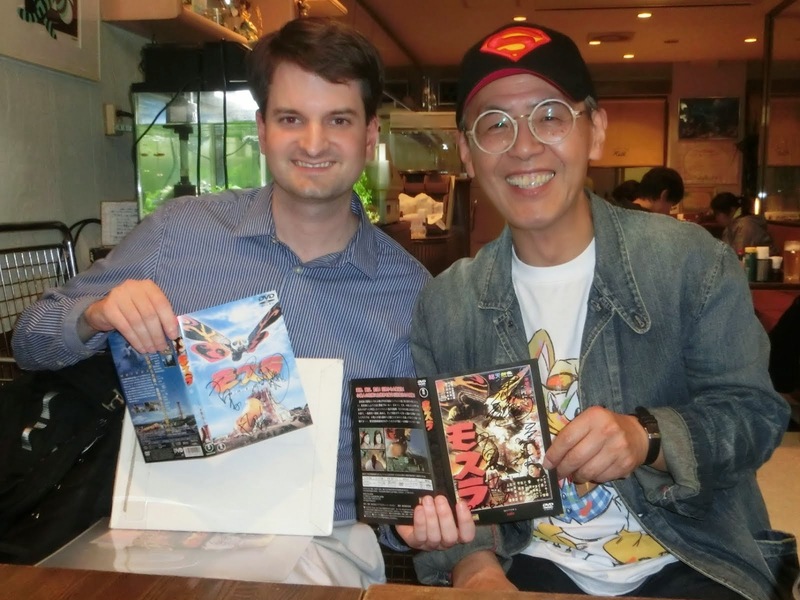 Banno-san directed the cult classic Godzilla vs. the Smog Monster (1971) and was an executive producer on Legendary Pictures' Godzilla (2014). He served as an assistant director to Akira Kurosawa on four films: Throne of Blood (1957), The Lower Depths (1957), The Hidden Fortress (1958), and The Bad Sleep Well (1960). 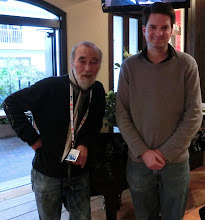 He co-write and assistant-directed the Toho disaster film The Last Days of Planet Earth (a.k.a. Prophecies of Nostradamus, 1974). 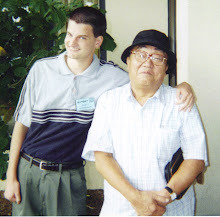 I'd been in touch with Banno-san since I first met him in the U.S. in July 2005. 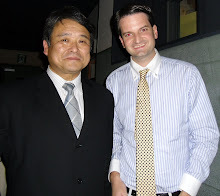 When I moved to Japan in March 2011, he was one of the first people (if not the first) to share his cell phone number with me. 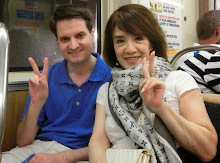 When I visited Tokyo for the first time in May 2011, he was the very first person I visited. 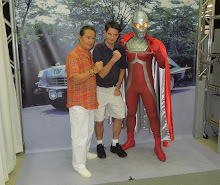 Yoshimitsu Banno poses with Akira Takarada in May 2011. Photo by Brett Homenick. 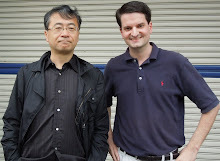 Banno-san and I would regularly meet at the Cafe Chat Noir near Mukogaoka-Yuen Station in Kawasaki, Kanagawa. 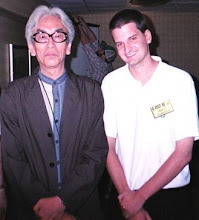 There he would often talk to me about his latest projects. 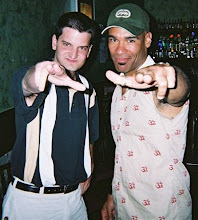 He always had boundless energy and was determined to make another movie. I was sure he would. 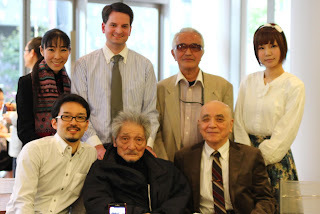 A group shot from May 2013 with composer Riichiro Manabe (front row, middle) and Yoshimitsu Banno (front row, right). 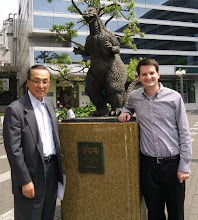 Last year, when we met at the cafe on my birthday, Banno-san told me that he was planning to give me a Godzilla figure that he owned, but his wife balked at the idea, as she believed Godzilla was protecting him. Who could ask for a better protector? 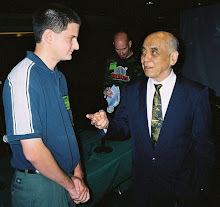 Yoshimitsu Banno with his autobiography. Photo by Brett Homenick. Last year, he finally published his autobiography in Japanese. He wanted to publish it in English, but I'm not sure what, if anything, will come of those plans. 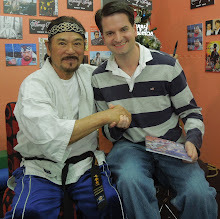 When I met him for the last time on November 20 last year, he gave me a copy of his autobiography and signed it for me. Suffice it to say, I was glad to receive it. 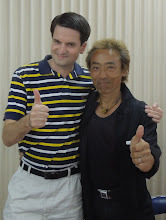 When we met in November of last year, Banno-san seemed a bit weaker than his usual self. 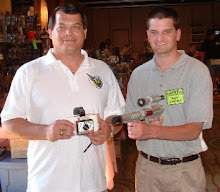 I didn't think much of it, as it didn't seem to impact his passion for future projects. 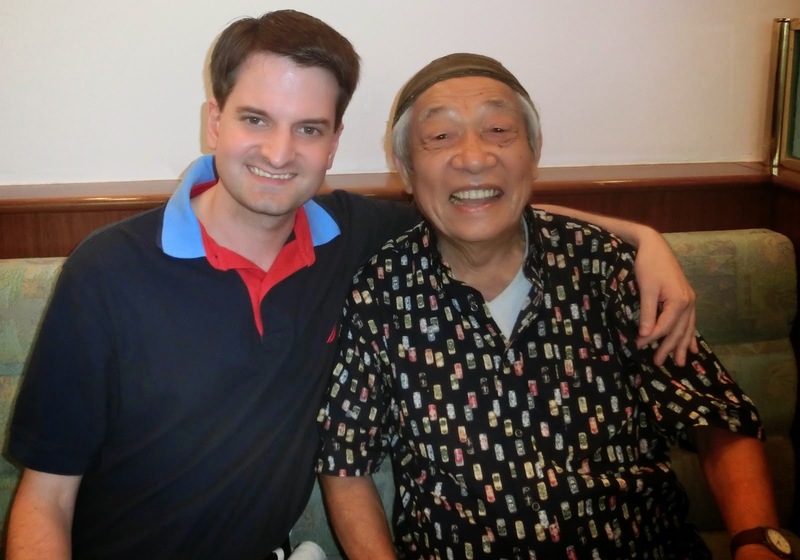 This past week, I reached out to Banno-san via e-mail, asking if he'd like to get together soon. The date I pitched, in a truly strange coincidence, was Sunday, May 7. 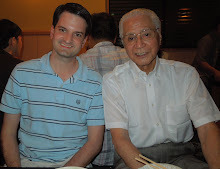 The next day, May 3, Banno-san called me and left a voice message, saying that he wasn't feeling well, but that we'd meet another time. I tried calling him back and left a voice message, acknowledging his phone call. 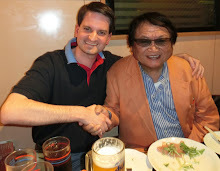 Banno-san called me back on May 4 and left me another voice message. Suffice it to say, I regret not being available to take his final calls to me. 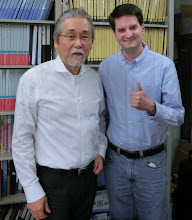 I'll always be grateful to Banno-san for his constant support and fellowship. 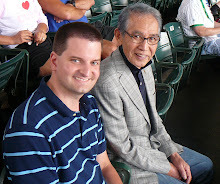 Thank you, Brett, for such a great tribute to Banno-san. 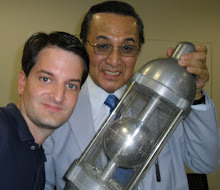 I came across your blog while searching for confirmation on the passing of Banno-san. 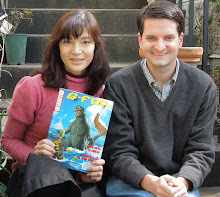 Truly a sad loss, as Godzilla vs. Hedorah was my introduction to Godzilla and co. It remains my favorite film to this day. I shared a link to this entry on Twitter, hopefully it's okay with you. 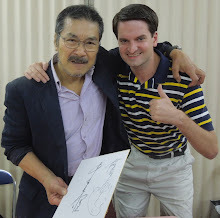 RIP Banno-san and thank you for starting it all for me. I'm thankful and envious that you were in touch with him. I hope his autobiography gets translated one day. Very sad news. He was a very talented filmmaker, but as your meetings with him over the years showed he was even more importantly a very kind man. 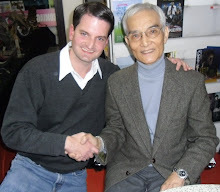 My favorite era of Godzilla films is the Showa era, and it is very sad to know that now all of the directors of those films are no longer with us. Thank you for always keeping us informed Brett. Your efforts are most appreciated. A wonderful tribute to a very gentle man. MORE PICS! Rodan Takes to the Skies! MORE PICS! 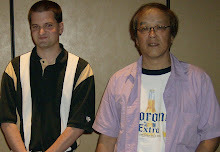 Hiroyuki Takano's Dinner Party!